I love how this one turned out in the end. At one stage I was ready to start again but I just kept working on it and suddenly it all come together. Autumn Pathway measures 2.5 x 3.5 inches and is painted on 300gsm smooth Arches watercolour paper. I love how this cottage is set into the cliff face. 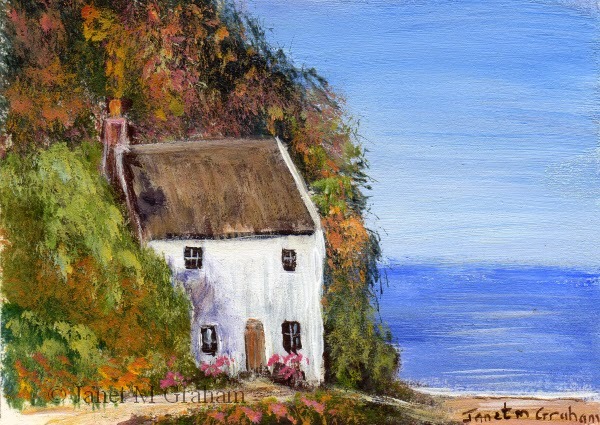 Cottage by the Sea measures 3.5 x 2.5 inches and is painted 300gsm smooth Arches watercolour paper. I changed this one a bit by adding in the Bluebells. The reference photo was more a summer scene so I decided to add some colour by adding in the flowers. 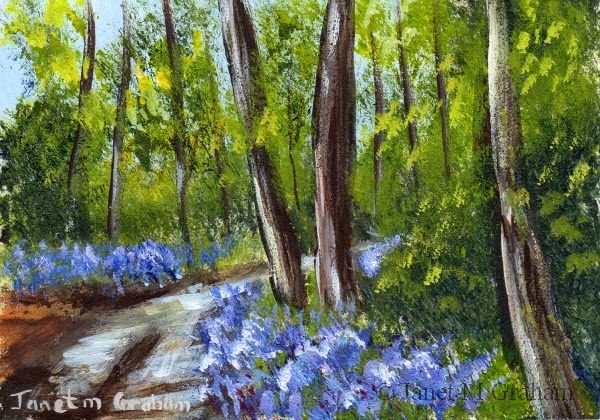 Bluebell Trail measures 3.5 x 2.5 inches and is painted on 300gms smooth Arches watercolour paper. Many thanks to Wanda McDonald for the reference photo. I decided to paint a seascape for a change. 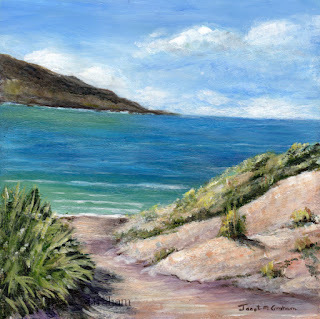 Path to the Sea measures 6 x 6 inches and is painted on Ampersand Gessobord Panel. I love the colouring of this bird and the position it is perched on the branch. Really pleased with how it turned out. The Bar - Throated Minla is found on the Indian subcontinent and Southeast Asia. They measure around 16 - 18.5 cm and weigh between 14 - 24 grams. 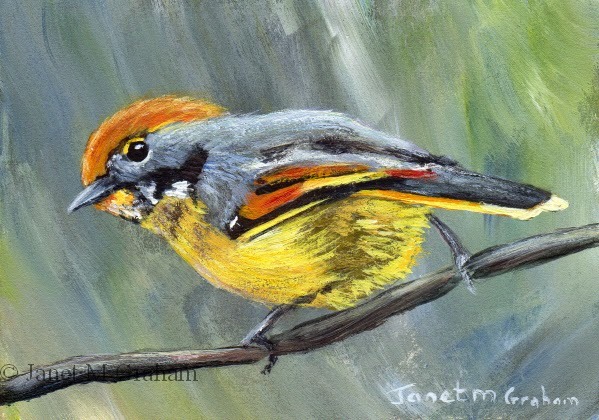 Bar - Throated Minla measures 3.5 x 2.5 inches and is painted on 300gsm smooth Arches watercolour paper. The Wood Warbler breeds throughout Northern and temperate Europe. They measure around 11 - 12.5 cm in length. 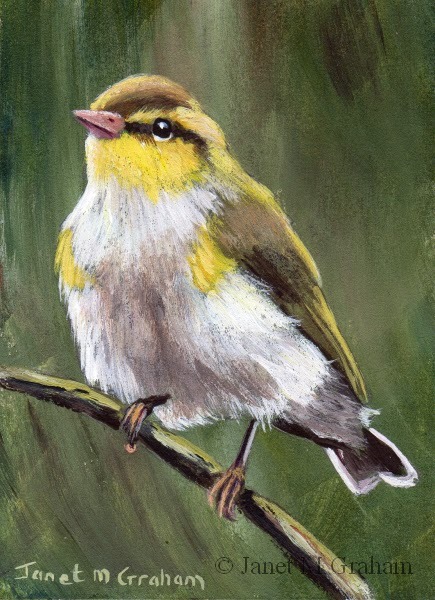 Wood Warbler measures 2.5 x 3.5 inches and is painted on 300gsm smooth Arches watercolour paper. I really enjoyed painting this one. One thing I do really like about the gessobord panel compared to the canvas panel is the smooth surface as it allows me to get a more mottled background affect. Also helps using the different brand of professional white acrylic paint to my normal brand which can be reopen with water so it does pay to experiment with different brands to find the right combination that works. 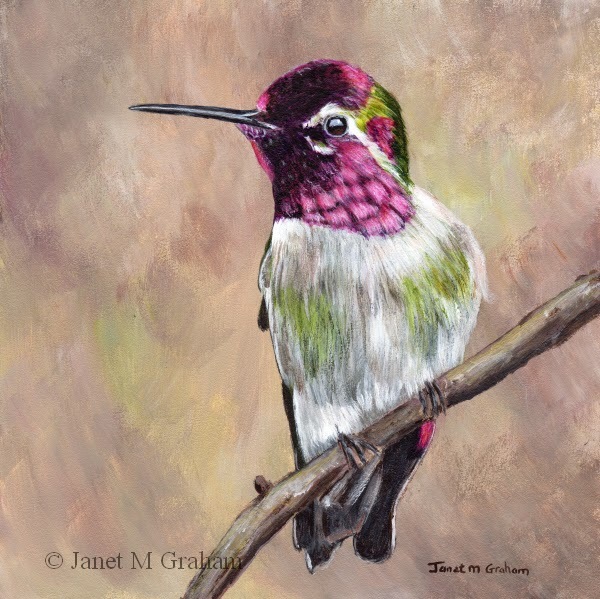 Hummingbird 2 measures 6 x 6 inches and is painted on Ampersand Gessobord panel. The European Bee - Eater breeds in Southern Europe and parts of North Africa and western Asia. It measures 27 - 29 cm in length. 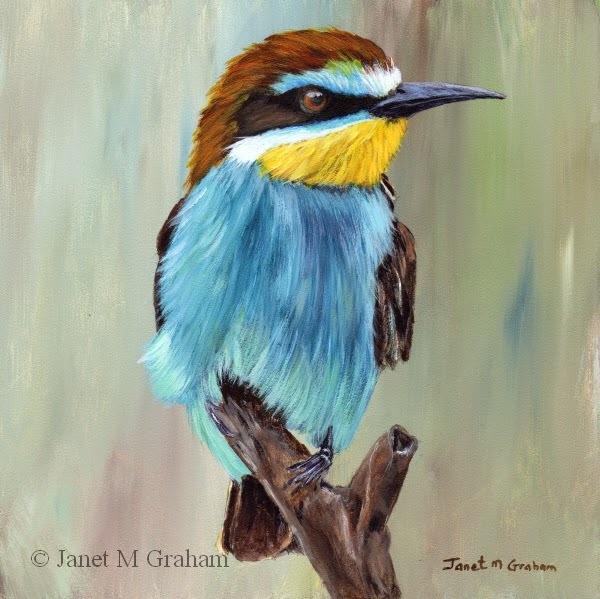 European Bee - Eater measures 6 x 6 inches and is painted on Ampersand Gessobord Panel. 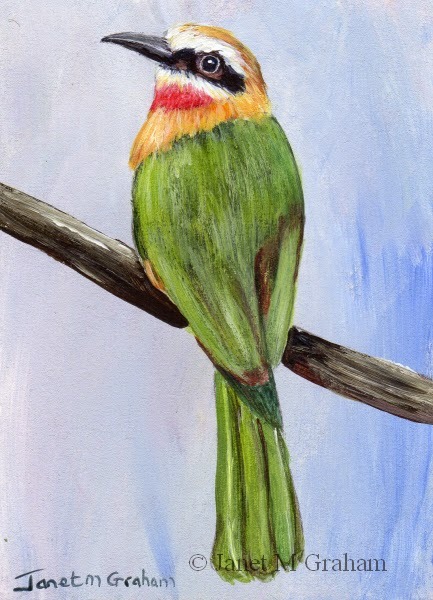 For my next little bird painting, I painted this beautiful kingfisher. I love its blue feathers. The Woodland Kingfisher is found in Africa. They measure around 20 -23 cm in length. 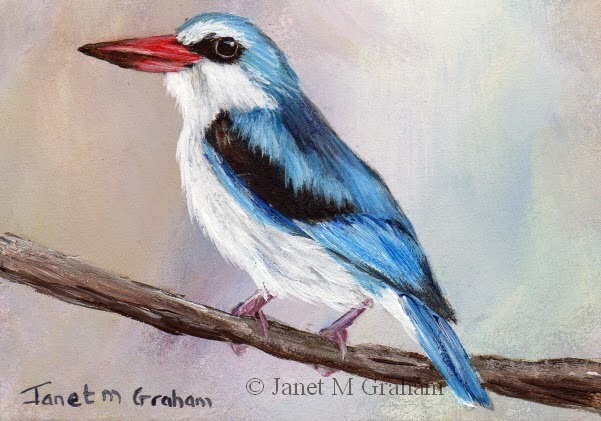 Woodland Kingfisher measures 3.5 x 2.5 inches and is painted on 300gsm smooth Arches watercolour. Really pleased with this one - everything just seemed to work. Since my new brushes arrive last month, I have found I have been using a combination of the No 2 rigger brush and a No 4 pointed round brush when painting the little bird paintings. The no 4 pointed round has a slighter longer point compared to the No 3 round that I usually use and it works rather well for the details. I was going looking through photos from my holiday to Tasmania a few years back and come across the view of the lavender fields at Bridestowe Estate so decided to paint it. Really pleased with how the painting turned out. 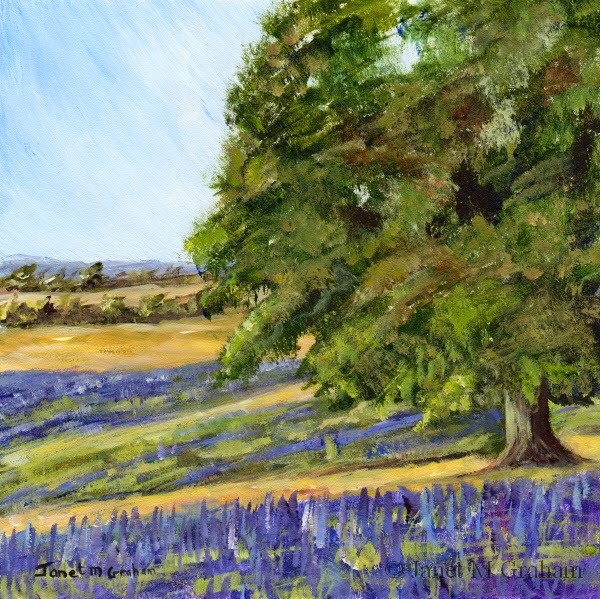 Lavender Fields measures 6 x 6 inches and is painted on Ampersand Gessobord Panel. 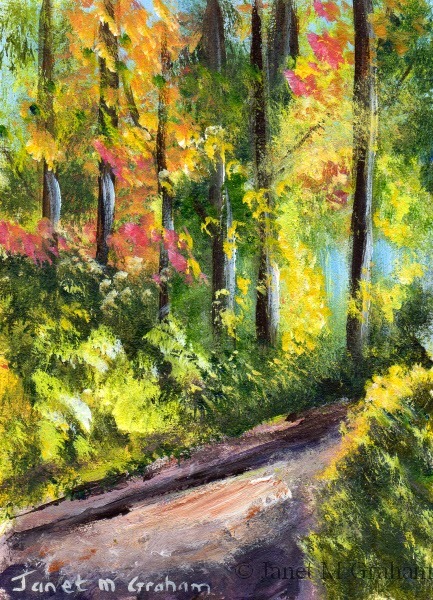 And for the last one, I painted this little forest scene. 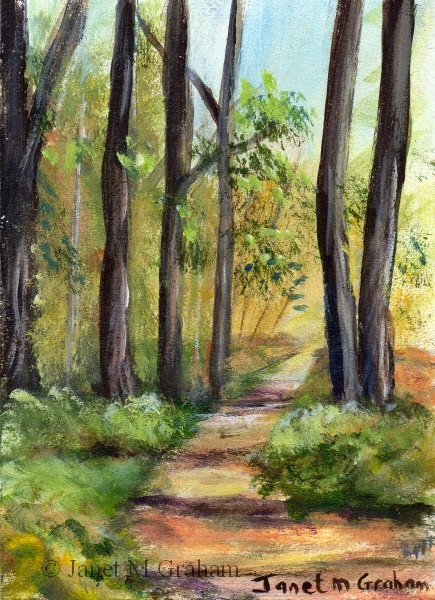 Forest Path measures 2.5 x 3.5 inches and is painted on 300gsm smooth Arches watercolour paper. So for my next little landscape, I painted this little bridge scene. 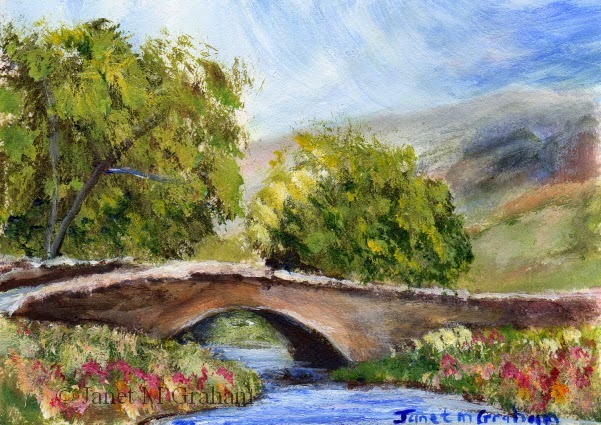 Country Bridge measures 3.5 x 2.5 inches and is painted on 300gsm smooth Arches watercolour paper. 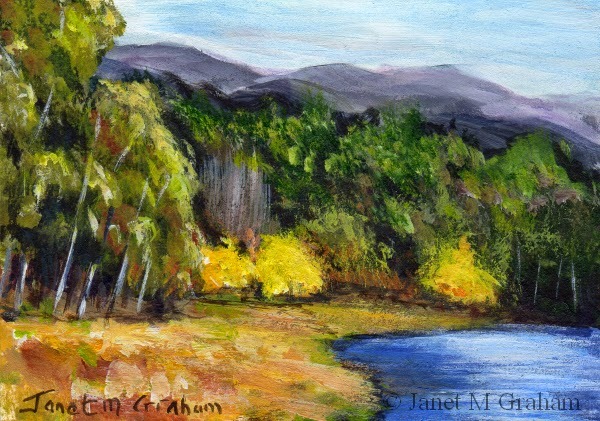 I decided to paint a few landscape aceo's. This is the first one - really pleased with how it turned out. 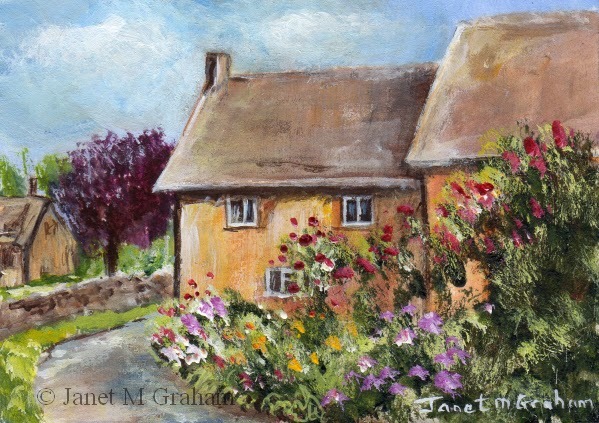 Country Lane measures 3.5 x 2.5 inches and is painted on 300gsm smooth Arches watercolour paper. I really enjoy painting this one. Everything just seemed to work. The Yellow Warbler is found across North America and down to Northern South America. They measure are around 10–18 cm in length and weigh between 7 - 25 grams. 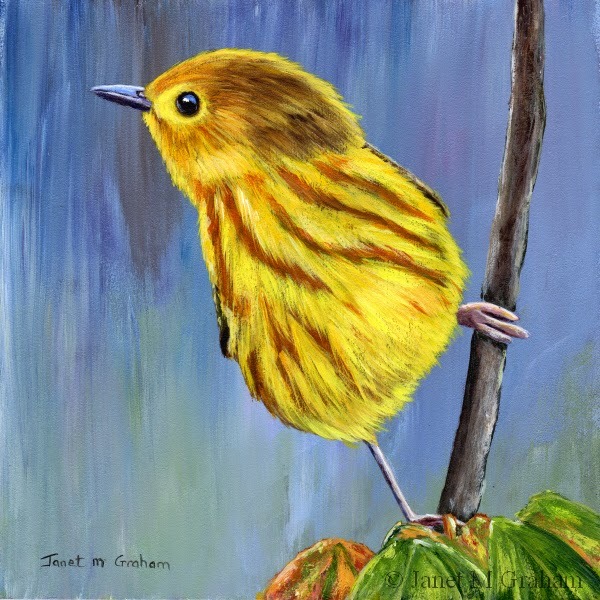 Yellow Warbler 2 measures 6 x 6 inches and is painted on Ampersand Gessobord Panel. I ended up using Magenta and Ultramarine blue to create the violet / purple feathers which seemed to work rather well. The Violet - Backed Starling is widely found on mainland sub - Saharan Africa. It is also known as Plum-coloured Starling or Amethyst Starling. They measure around 18 cm in length. 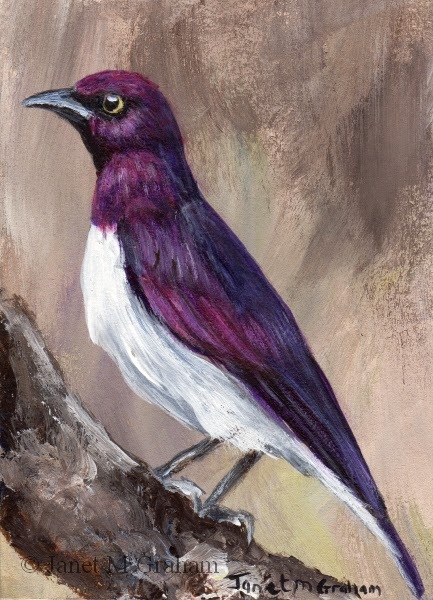 Violet Backed Starling measures 2.5 x 3.5 inches and is painted on 300gsm smooth Arches Watercolour paper. Love the blue feathers of this one. 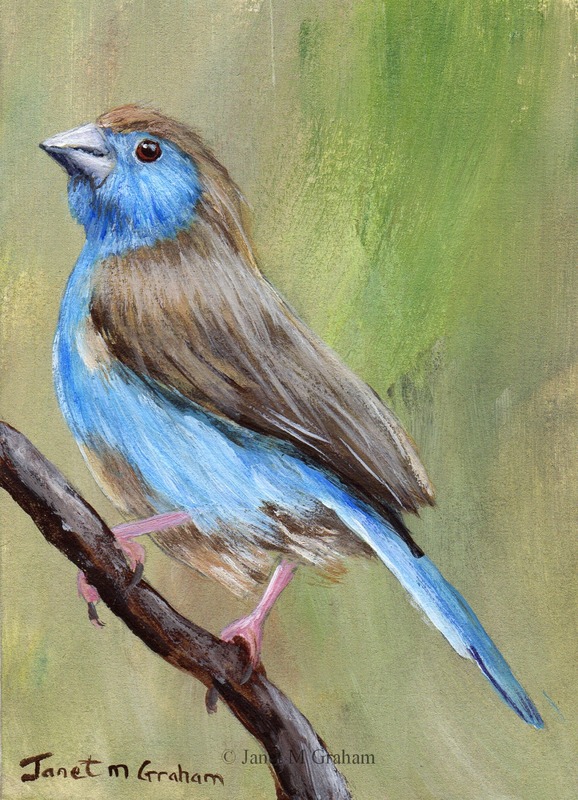 The Blue Waxbill is estrildid finch found in Southern Africa. They measure around 12 cm in length and weigh between 8 - 13 grams. 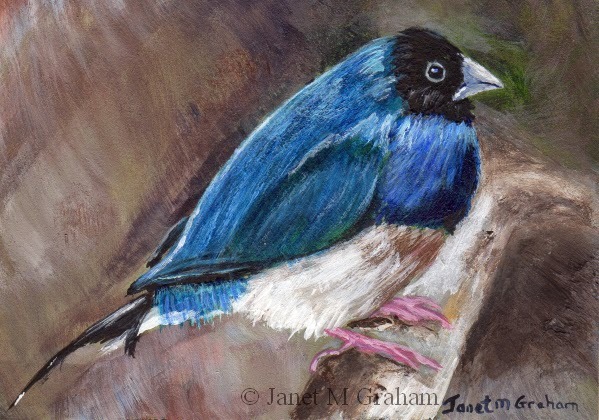 Blue Waxbill measures 2.5 x 3.5 inches and is painted on 300gsm smooth Arches watercolour paper. 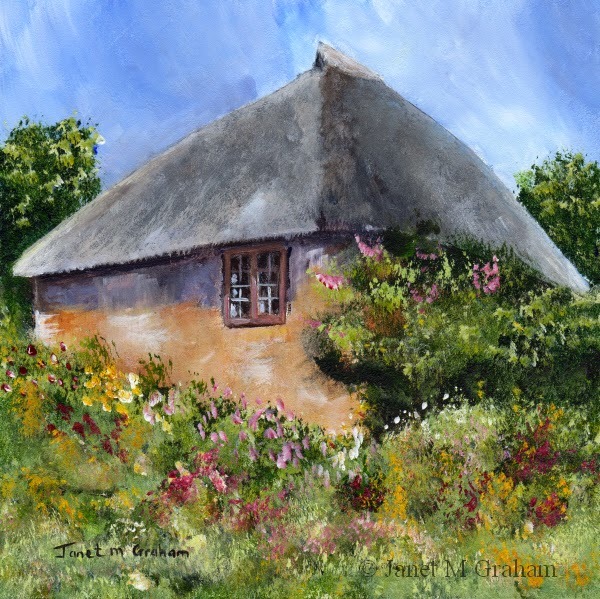 Cottage Garden measures 6 x 6 inches and is painted on Ampersand Gessobord Panel. Many thanks to Andre Van De Sande for the reference photo. Originally I wasn't going to paint in the reeds but after I had finished the bird, the painting was looking a bit flat so I ended painting them in which then brought the whole painting to life. Really happy with how it turned out in the end. The Mountain Bluebird is the state bird for Idaho and Nevada. They range in length from 16 - 20 cm and weigh on average 30 grams. 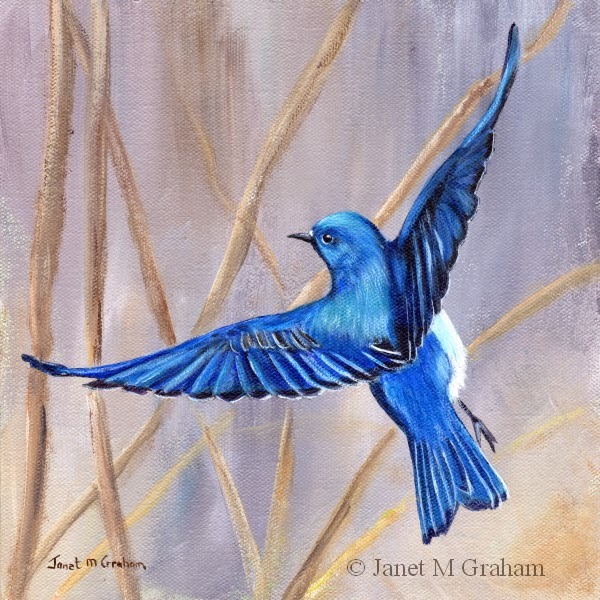 Mountain Bluebird measures 8 x 8 inches and is painted on Raymar Canvas Panel. I was going through my photos the other day from my visit to the Canberra Floriade a few years ago back and come across this one which I decided to paint. 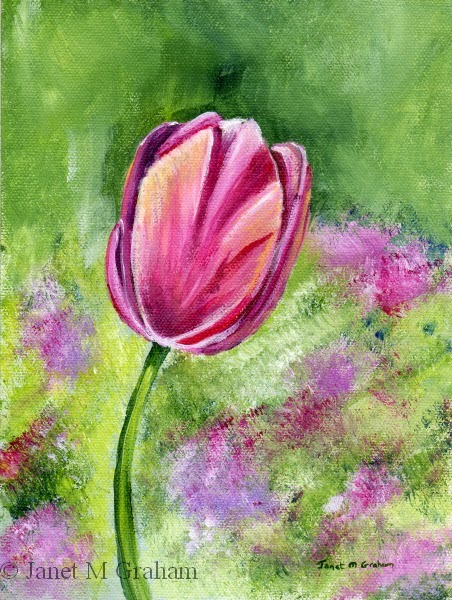 Pink Tulip measures 6 x 8 inches and is painted on Raymar Feather lite canvas panel. I love the vibrant colours of this parrot. Everything just worked with this one. Macaw's are native to Central America. There are 17 species of macaw's and this one would be a blue and gold macaw. They measure around 76 - 86 cm in length and weigh between 900 to 1500 grams. 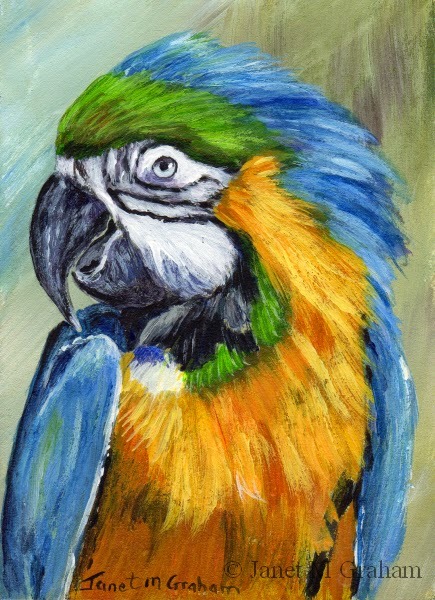 Macaw measures 2.5 x 3.5 inches and is painted on 300gsm smooth Arches watercolour paper. Many thanks to Mary Dolling for the reference photo. I love this ones colours. It did give me a few problems when painting it. I had to change the background colour as what I started out with just didn't work. Also I had to work a bit on the branch to get it to fade into the background but I got there in the end and I am rather pleased with how it turned out. Wild Gouldian Finches can be found in northern Australia. Gouldian finches can be red, black or yellow. Through selective breeding, colour mutations of blue, yellow and silver instead of a green black have developed on both body and breast colour. So this one has been bred. They measure around 13 - 14 cm in length. Black Headed Gouldian Finch measures 3.5 x 2.5 inches and is painted on 300gsm smooth Arches watercolour paper. Many thanks to Terry Krusak for the reference photo. This one was fun to painting. Rather pleased how it turned out. Autumn Begins measures 3.5 x 2.5 inches and is painted on 300gsm smooth Arches watercolour paper. I changed this one quite a bit from the reference photo. I added in the waterfall which I think makes these little scene more interesting. 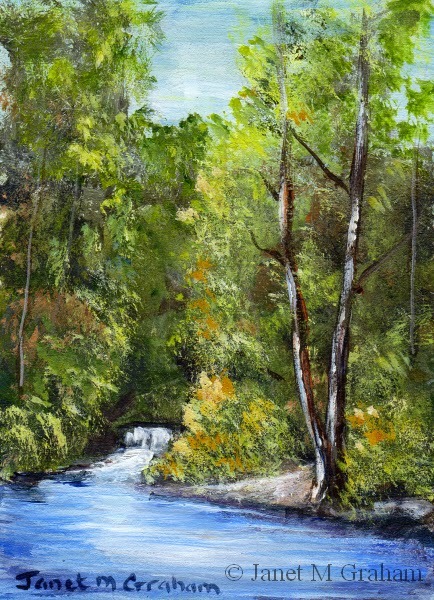 Waterfall measures 2.5 x 3.5 inches and is painted on 300gsm smooth Arches Watercolour paper. Many thanks to Kaye Gates for the reference photo. 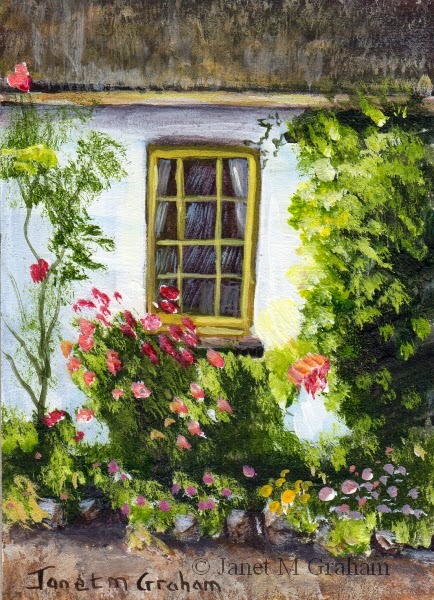 Cottage Window measures 2.5 x 3.5 inches and is painted on 300gsm smooth Arches watercolour paper. Many thanks to Mary Weir for the reference photo.